Start by prepping a Blacktip or other good eating Shark in the 3 foot range. Next slice in about 1/2" pieces with a sharp knife and skewer together like shown. Rub with Olive oil and put your favorite blackened seasoning on it, all four sides. Heat a cast iron skillet to white hot and cook Shark on all four sides until done to your liking (about 1 to 2 min a side). Serve hot with rice or other side and watch your guests go wild! From time to time I will put up some of our favorite recipes and if you would like, go to our facebook page and show us some of yours! is what it's all about! Season with butter, ole bay or your choice and lay meat side down on hot grill for a couple min to brown that side. 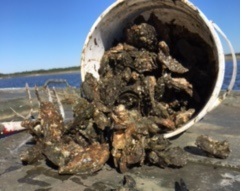 This winter go out on a dead negative tide and get ya some good sized oysters. Clean and shuck em at the house without loosing the juices. 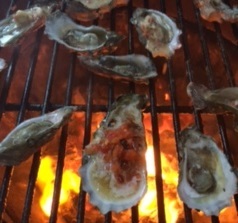 Lay on a hot grill or plate over a fire and dose with some melted butter and ole bay seasoning and let butter melt. Have some onion and red pepper chopped up ready and put it on after the butter. When the butter melts and the juice is bubbling, put some shredded parmesan cheese on em and when that is melted pull em off and serve hot. They will make an oyster eater's tongue slap their brains out! come on winter time.